At the closing press conference of the 123rd Canton Fair, Xu Bing, Deputy Secretary General of the Canton Fair, Spokesperson and Deputy Director General of China Foreign Trade Centre, said that as of May 3rd, the total number of buyer attendance at the Canton Fair was 203,346, an increase of 5.3% year-on-year. This number crossed the threshold of 200,000 again, the highest level for 5 years. Compared with the same period of last year, there was growth on all five continents. The rate of increase from high to low was 12.76% in the Americas, 8.07% in Europe, 7.24% in Africa, 4.19% in Oceania, and 2.29% in Asia. Buyers from ASEAN remained basically stable, with the Philippines increasing significantly and Vietnam increasing steadily. The former Soviet Union and Eastern Europe showed an overall growth trend, with Russia, Ukraine, Mongolia, and Kazakhstan increasing significantly. Buyers from countries in the “Belt and Road Initiative” were steadily growing. The number reached 90,576, an increase of 3.86% year-on-year, accounting for 44.54% of the total. This is an important source region for Canton Fair buyers. The quality of buyers has steadily increased. The buyers’ number from developed economies generally grew, with the United States increasing by 7.85%, the EU by 6.56%, and Canada and Australia by 4.57% and 3.9% respectively. The number of buyers attending the Fair for more than 10 times reached 50,758, representing a year-on-year increase of 3.77%. 109 of the world's top 250 retail chain companies attended the Fair. On the one hand, the international and domestic macroeconomic situation is generally good. Since the beginning of this year, the world economy has continued to recover and international trade has maintained growth. International economic organizations such as the International Monetary Fund and the World Trade Organization have respectively raised relevant forecast data. According to the forecast of IMF, the world economy would grow by 3.9% in 2018, 0.2 percentage points higher than that in 2017, reaching a record high since 2012. The latest report released by the World Trade Organization predicted that global trade in goods would increase by 4.4% in 2018. We can say that the demand in the international market as a whole is growing. At the same time, China's economy maintained stable and its steady progress has been further consolidated. With the continuous deepening of supply-side structural reforms, the endogenous driving force for the development of China’s foreign trade continues to increase. The Ministry of Commerce, together with relevant departments, has thoroughly implemented a series of policies and measures promulgated by the State Council to promote the development of foreign trade, properly responded to all types of trade protectionism, consolidated the growth trend of the past year, and achieved rapid growth in imports and exports in the first quarter of this year. 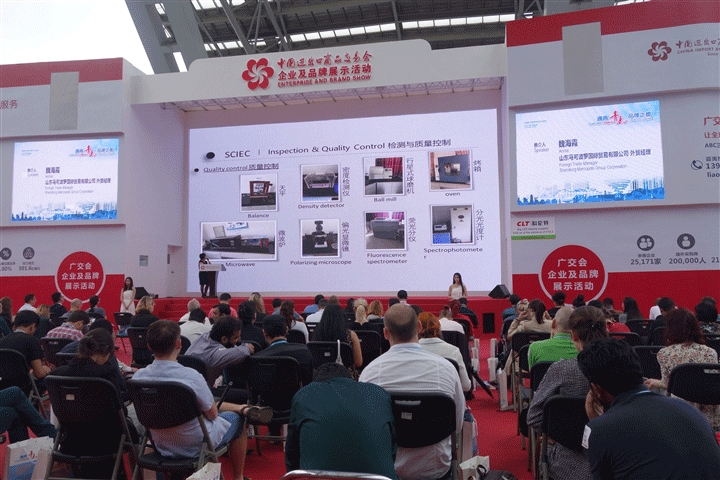 On the other hand, continuous innovation has been made in the concept and model of Canton Fair’s marketing. In recent years, China Foreign Trade Center has adhered to professional and targeted marketing concepts, in accordance with the principle of combining the export industry with the export target market, innovated the concept and method of marketing, and widely invited global buyers to the Fair. The first is to build the most international global cooperation network. In recent years, we have vigorously promoted the Canton Fair Overseas Partnership Program, established partnerships with 113 important industrial and commercial organizations in 67 countries and regions around the world, and launched comprehensive cooperation in the Canton Fair’s global promotion and services, etc, which provided great convenience to buyers. The second is to implement "three targeted measures." Through the use of new media such as social media and search engines, we’ve conducted targeted marketing for target markets and customer groups, carry out initiatives such as “Regular Buyers Invite New buyers”, “Exhibitors Invite Buyers”, buyer incentive programs, matchmaking, and improve on-site services. We’ve implemented targeted marketing, targeted invitation, and targeted services to continuously expand the scope of invitations, increase the attendance rate, and enhance buyers' experience and return on investment. Note: The article was reproduced at the Canton Fair Press Center.